Getting to know the wild mushrooms growing around you can be rewarding and enriching. Many mushrooms you’ll find are edible and delicious. There are others with potent medicinal compounds that can help keep you healthy or support recovery from disease. Of course, some mushrooms are poisonous, causing gastric distress or even death! Exploring the world of fungi is always a good thing to do with a seasoned guide. Join us and learn all about wild mushrooms in their natural habitat. Click for more info and to register! A good way to begin learning how to identify wild mushrooms is simply to observe them in their natural habitats. As you pay closer attention to their strange beauty, you’ll begin to detect the differences that make them unique. 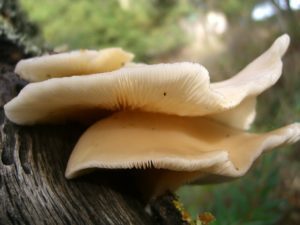 Some mushrooms have stripey gills on their undersides; others have sponge-like pores, or tiny teeth. There are mushrooms that sprout up out of the duff and others that you find high up in the trees. Certain species of wild mushrooms are always found in the vicinity of a particular kind of host tree, while others pop up all over the place. When you gently squeeze a mushroom, it will bruise. The color of this bruising can help you identify it. Every true mushroom makes spores. The color of these spores can help identify which wild mushroom you have happened upon. It’s easy to take a spore print by resting an open mushroom cap on a piece of paper or cardboard for several hours without disturbing it. The spores will drop onto the paper or cardboard. 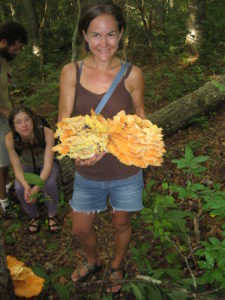 If you know someone who is familiar with wild mushrooms, take a hike with him or her! 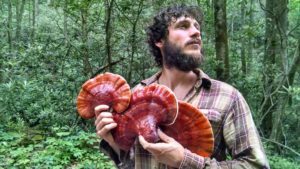 We welcome anyone in the Southeast to join us and learn all about edible mushrooms in North Carolina. 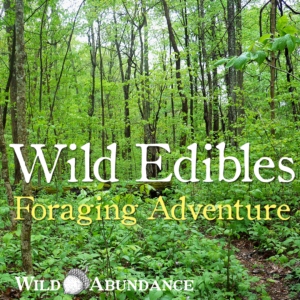 Every spring Wild Abundance hosts a Wild Edibles Foraging Adventure with our region’s top naturalists. Wild mushrooms are some of the most fun and fascinating specimens to find along the trail. Identifying fungi can be tricky, and because some are poisonous, the stakes are high. In the absence of an expert teacher, getting a good field guide is the next best thing. Our friend and colleague, Todd Elliott, co-authored the recently published Mushrooms of the Southeast (Timber Press). If you are in our bioregion, this is a great guide to get your hands on. A good global guide is Mushrooms Demystified by David Arora (Ten Speed Press), along with it’s pocket-sized accompaniment, All that the Rain Promises and More, also by David Arora. Regional field guides can be found depending on where you live. Here are the profiles of eight fairly common wild mushrooms that are tasty and/or medicinal. If you spend time in the woods after a rain followed by sunny days, chances are you will come upon at least one of them. Foraging for mushrooms is like a treasure hunt. The excitement of finding this treasure makes exploring the wilds even more fun! These tasty gray to beige tender mushrooms are some of the most common in our region. They are decomposers of wood from broadleaf trees, meaning you will find them on dead and dying logs and branches. Tulip Poplar trees are one of their favorites. Oysters are fairly easy to identify and have few close look-alikes. A good mushroom for beginners! Medicinally, oysters are most notable for their ability to help control cholesterol levels. Additionally, they contain compounds that support the immune system, help tonify the liver, and slow the aging process in living cells. The Latin name sulphureus alludes to the bright yellow color of chicken of the woods. Like oysters, they are decomposers of wood, but can also be found on living trees. In these cases, the fungus is decomposing the heartwood only, leaving the outer, growing tissue intact. Some of the largest edible mushrooms we’ve collected have been chicken of the woods. When they are young and tender, well-cooked chicken of the woods are a tasty chicken-like addition to meals. Older mushrooms are better off boiled to flavor chicken (of the woods) broth, as they are too tough to enjoy chewing on. It is especially important to cook chicken of the woods thoroughly. Cases of gastrointestinal distress have been recorded when these mushrooms are undercooked or eaten raw. Certain compounds found in chicken of the woods have been shown to be effective against some kinds of cancer. They’re not typically known as a medicinal mushroom, but there are currently studies investigating their potential in this realm. Be sure to cook thoroughly! Reishi could be the most well known and the most mystical of the wild mushrooms. The famous Chinese species of Ganoderma, lucidum or “red reishi,” is known as the mushroom of immortality. It has been a prized medicine for centuries and features prominently in Chinese medicinal formulas. Current research shows high potential for our native species (most common ones listed above) to contain many of the same healing compounds as lucidum. Here in Western NC, the easiest reishi to forage for is G. tsugae, or hemlock reishi. The blessing of their abundance is sadly connected to the demise of our hemlock trees due to infestations of the non-native hemlock wooly adelgid. Reishis are decomposers of wood, although they are sometimes found as parasites on living trees. Some people slice off the softer, white growing edge of reishis and cook them up as a food. It’s much more common to slice and dry the whole mushrooms to be boiled as tea or made into an alcohol tincture. The flavor is not generally regarded as pleasant, and it is very bitter. Red reishi, or G. lucidum has been widely studied for its medicinal compounds and uses. In both Western and Chinese medicine, reishi has been used to treat allergies, insomnia, rheumatoid arthritis, hypertension, liver disease, cancer, anxiety and neurological decline and to support general immune function. It is likely that our native reishi species contain many, if not all, of the medicinal properties of their heavily researched Asian cousin. Chaga is the least mushroom-like of the mushrooms listed here. It is a parasite, mostly on birch trees, but also on alder, elm and spruce. The part that we harvest is technically not a “mushroom” at all, but a sclerotium, also known as a “canker.” The crusty, dark mass is a storage organ and not a reproductive part, like other mushrooms. Chaga is found high up in trees, bursting forth from their bark, and can appear somewhat like a burl or burn scar. Throughout the boreal forests of Russia and other parts of Northern Europe, chaga is an important cultural and medicinal mushroom. Like reishi, chaga is not a food per se. It is hard and dry and best used in teas. The flavor is rich and pleasing, not bitter or overly medicinal like reishi. Some of chaga’s healing compounds are destroyed by high heat, so steeping it in warm but not boiling water is ideal. Chaga’s medicinal uses include the treatment and prevention of cancer, general immune support, digestive disorders, skin disorders, and as an antiviral. 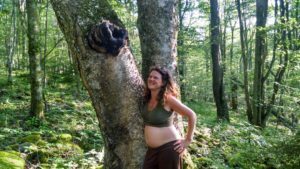 It is fabled that in some traditional cultures in Russia, a chaga infusion was used to bathe newborn babies. 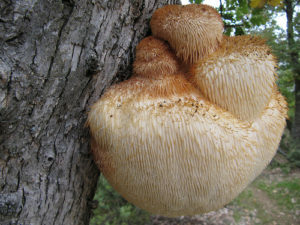 This distinctive mushroom appears like a shaggy ball or mass, typically associated with wounds on the trunks of broadleaf trees. It is white when young, sometimes with a pink tinge, and turns yellowish with age. A tasty treat, with a distinctive sweetness some people claim is reminiscent of crab or lobster. Like oyster mushrooms, lion’s manes are delicious stir-fried with butter, garlic and salt. Unlike oysters, when you find a lion’s mane mushroom in the wild, you typically only find that one and not a flush or group of mushrooms. Along with being delicious, lion’s mane is also a valuable medicinal. Primarily, it is used to treat and prevent nervous system disorders, including Alzheimer’s, MS, dementia, anxiety, depression, menopausal syndrome, neuropathy and nerve damage. The species name versicolor reflects the wide range of colors this mushroom can display. 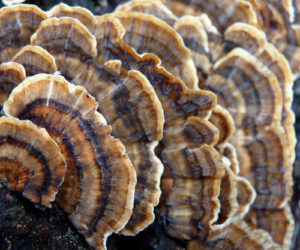 This fact, along with the presence of numerous look-alikes can make turkey tail a tough mushroom to ID for beginners, even though it is very common. The shape is flat and fan-like, with concentric stripes of color from the base to the outer edge — brown, gray, blue, beige, yellow, reddish brown: All of these colors are fair game. Turkey tail is a polypore, meaning that its underside looks like a very fine sponge with a collection of tiny holes. It does not have the stripey gills you might be familiar with on button mushrooms. Often seen as a “weed” mushroom, this fungus is voracious and will usually colonize an entire log or pile of logs, with the fan-line mushrooms erupting out all along the length. Leathery and tough, this is another one for teas or soup stocks. It doesn’t have a very strong flavor. Turkey tail’s main medicinal use is in the treatment of cancer. Extracts from the mushroom are used in conjunction with chemotherapy and other western treatments in China and Japan. It’s interesting to note that the constituents of turkey tail that have been studied and are used in cancer treatment are water soluble but not alcohol soluble. Turkey tail is not appropriate to make into tincture. 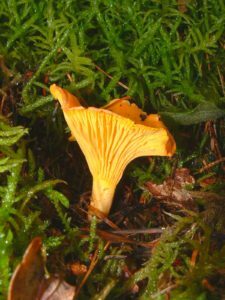 Chanterelles are like the forager’s “pot of gold.” These bright yellow-orange mushrooms stand out against the drab forest floor where they are found and are quite delicious. Forming mycorrhizal associations with trees, chanterelles pop up beneath those trees whose roots they are collaborating with. Most chanterelles are somewhat funnel-shaped, with variation among different species. 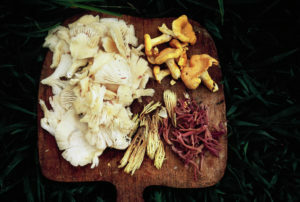 Many kinds of chanterelles are fairly easy to identify, but they do have several look-alikes, including poisonous ones. 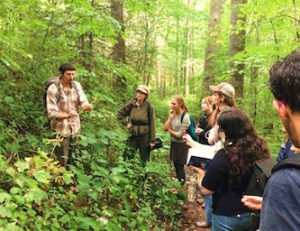 We always recommend learning about edible mushrooms in North Carolina with seasoned guides and teachers until you feel comfortable distinguishing them. Chanterelles aren’t considered a medicinal, but like all mushrooms, they are nutrient-dense and nourishing. With high levels of B vitamins and iron, especially for a non-animal food, chanterelles are as healthy as they are delicious. With butternut squash, strong cheeses, great ravioli filling! There is a big difference between the chicken and the hen, when it comes to mushrooms. Hen of the woods, also known as maitake, is somewhat similar structurally to chicken of the woods (Laetiporus sulphureus), but isn’t bright yellow and is an impressive medicinal, along with being delicious. Considered a weak parasite to tree roots, hen of the woods is usually found at the base of living trees, mostly oaks, or on the stumps of dead trees. If you come across a fresh mushroom, it can be harvested and cooked up like any other delicious edible. When you’ve arrived past its prime, not to worry! The medicinal properties of hen of the woods, along with its wonderful flavor are water-soluble. Older specimens make wonderful tea, or can be used as the base for a soup stock. 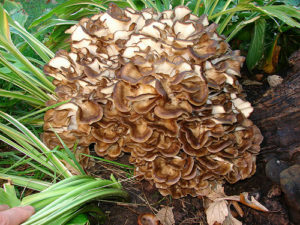 Hen of the woods is a powerful medicinal mushroom. It has been studied in treatments of cancer, diabetes, polycystic ovary syndrome, high cholesterol and hypertension, all with good results. Along with treating these specific conditions, the mushroom is antiviral and antimicrobial, and it supports general function of the immune system.